TRUMBULL, CT—Saying it’s the only time of day when everyone can be together in one place, the Gleason family confirmed Thursday that it strictly forbids smartphones to be used while eating dinner in front of the television. 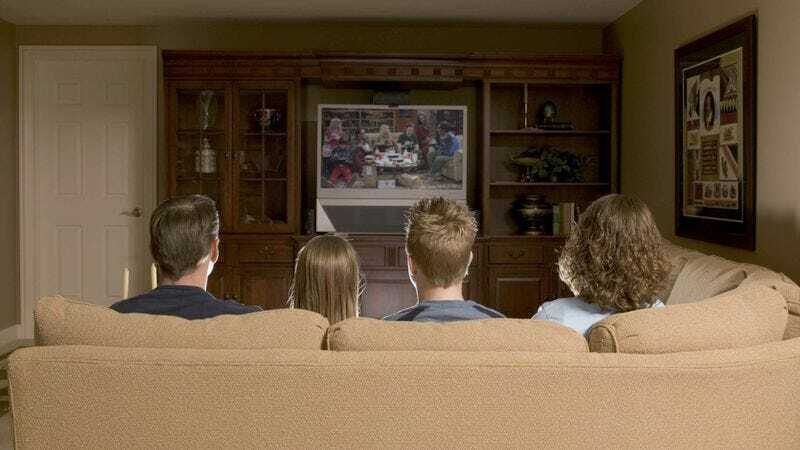 “Dinner is a chance for us to sit down as a whole family—is it really so much to ask that everyone puts down their phone for just one hour while we eat and watch some TV?” said mother Diane Gleason, adding that the rule gives the busy family of four a chance to enjoy shows stored on DVR without getting sidetracked by checking Facebook, playing games, or reading text messages. “We’re all so attached to our devices that we sometimes forget about taking time to come together for a little while, set aside our technological distractions, and watch The Big Bang Theory as a family. The kids may groan about it, but if it wasn’t for dinner, none of us might be caught up on any shows at all.” Gleason went on to say that even she had days when she’d rather be on her phone than watching The Voice, but knew it was important for the family that she follow the household rule at all times.